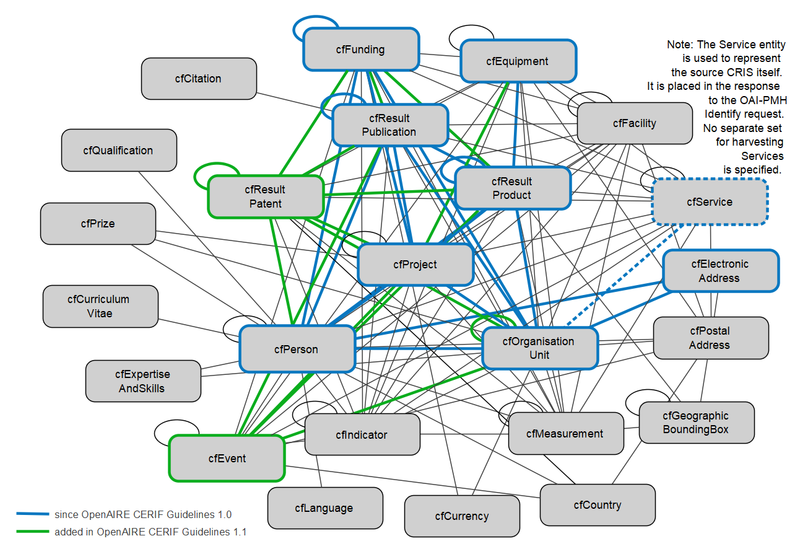 The CERIF model provides for research information objects to be classified according to their type, status, subject, etc. and for expressing the types of relationships. It does not, however, fix the semantic vocabularies to be used for such classifications; CERIF only recommends some that may have common applicability. For information communication to be successful, any CERIF profile needs to specify the semantic vocabularies so that producers know what to produce and consumers know what to expect. The OpenAIRE CERIF profile does precisely this and prescribes most vocabularies to be used. The most notable example is the fact that the types of research outputs are expressed using the COAR Resource Types vocabulary. CERIF has three entities to represent research outputs: Publications, Products and Patents. The COAR vocabulary was broken down into thee separate sub-vocabularies to be used with the respective entities. The following sections define the CERIF data elements for the exchange of data between individual CRIS systems and the OpenAIRE infrastructure. The exclusive use of the defined data elements and vocabularies is mandatory, i.e. no other data elements and vocabularies can be used in the CERIF XML data exposed by CRIS systems to the OpenAIRE infrastructure. The vocabularies are sourced from relevant outside sources; some of the vocabularies are based on the CERIF 1.5 Semantics. Extensions are possible in the review phase of these Guidelines.